The new Papo Woolly Rhino model is an excellent replica of the shaggy coated Rhinoceros whose fossils have been found in Pleistocene aged deposits across Europe. A number of Woolly Rhino fossils from the genus known as Coelodonta have been found in France, so it is fitting for a replica of this iconic Ice Age beast to be added to the French manufacturer’s model range. From the tip of its stubby tail (an adaptation for living in a cold climate), to the front edge of the model’s large anterior, nose horn, the replica measures approximately 17 centimetres long and stands a little over 9 centimetres high at the shoulder. If we compare this figure to the fossil record for Coelodonta in Europe, the size of this model can be estimated to be around 1:25 scale. 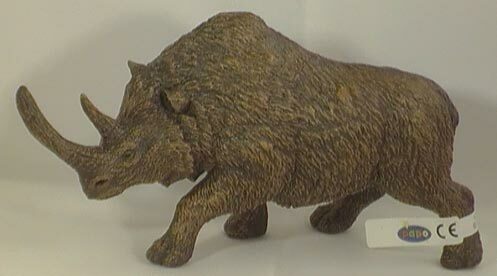 New for 2013 - Papo Woolly Rhino. The model is very well painted and the individual strands of long, shaggy hair that make up the coat of this animal can be clearly seen. The ears are pricked and facing forward, the eyes are relatively small, whilst the nostrils are quite large, suggesting that as with most members of the rhino family, the Woolly Rhino had poor eyesight and relied more heavily on its other senses such as hearing and its sense of smell to detect danger. This nicely detailed replica represents a grazing mammal that probably originated in Tibet, the descendants of these first Woolly Rhinos quickly spread across a wide geographical area, and fossil remains have been found over much of Europe including the United Kingdom, although there is very little evidence found to date to suggest that these large mammals, some of whom could have weighed up to 2,000 kilogrammes, ever got as far west as Ireland. The large, anterior horn (the one on the tip of the nose), has been carefully crafted and appears flattened. Like modern rhinos, the two horns of Coelodonta were made of keratin (compressed, fibrous hair). However, fossil evidence suggests that the anterior horn was not pointed but had a rather flattened, keeled appearance. Scientists believe that the horn of the Woolly Rhino got its strange, keeled shape as the rhino grazed moving its head from side to side wearing the sides of the horn down. The Woolly Rhino may have also used its horn to clear snow in order to find food. This prehistoric mammal could have had its own built-in snow plough. In conclusion, this is an excellent Woolly Rhino model, one that works well with the other prehistoric mammals and cavemen in the Papo range. A very outstanding and stunning Papo figurine, both in morpholoy and overall appearnace and stance. Its my opinion that this Woolly Rhino figurine is second to none. I especially like its action pose that Papo choose. I love the scientific research that Papo undertook before making its front horn keeled in shape. Just stunning. Great figure. This ornament my collection. Carefully constructed and detailed. Perfectly illustrates the features of this beautiful animal. It is sufficiently large and heavy. It is unfortunate that this animal became extinct. It was beautiful and majestic.